It's been a while since I posted a Lego Star Wars creation here, and now the time has come for a huge one. The GHOST, Hera's armed and armoured transport with stealth and cloacking technology, has to be my new favorite spacecraft in the whole Star Wars movies and animated series. It's definitely a significant step-up from the prequel and Clone Wars designs in that it manages a sturdy, no-nonsense look with some obvious allusions to World War 2 aircraft. Also, the GHOST is home to and base of operations of a great crew. So, it was only natural to put the characterful, yet very small-ish and stubby Lego set aside and build my own from scratch. 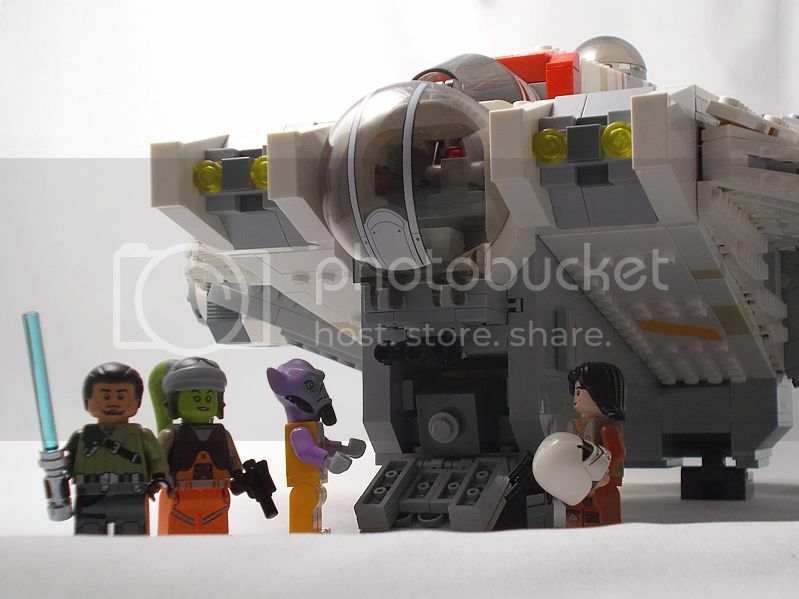 What's more, I haven't yet seen any larger MOC of the GHOST anywhere on the internet, so to be the first to do a significantly larger version was an additional incentive. Size does matter and yet it doesn't... Although it is possible to build this ship in minifig-scale, I settled for a half-minifig scale. That way, the final build could still be picked up as a whole, even though the model turned out to be more heavy than I thought. Also, space is a factor for me - in true minifig scale, the GHOST would be larger than the UCS Millenium Falcon in all dimensions and would never fit onto my display shelf. Lastly, the half-minifig scale is still large enough to include interior for the minifigs and some features. As always with my MOCs, I went for stability and correct proportions, shapes and angles. 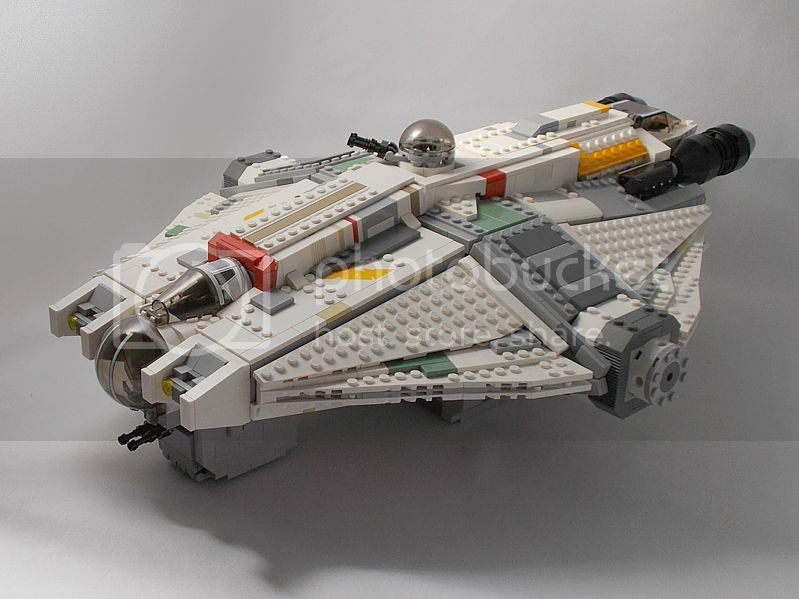 The MOCs I posted here before were largely small or tiny models: droids, Clone Walkers, Speeder Bikes, with an AT-ST and Ahsoka Tano's starfighter being the largest of them. In that regard, the GHOST turned out to be a nice challenge, and was a very fun build that stretched across the past week. I don't know if it was a good eye for the right proportions on my part, inspiration or sheer luck, but all the angled surfaces and the sturdy framework underpinning those came together without any major hickups and difficulties. Enough of my ramblings, here's the largest MOC (by far!) I've done, yet. Please comment, like, leave constructive criticism, or just tell everyone whether you like the design of this starship or not and why. Of course, the PHANTOM is detachable from the GHOST. I've not made a photo with the PHANTOM detached, but as you can see, when attached to the GHOST, it fits snuggly and tight. Please note that I will replace the white modified 8x1 plate that makes the outer edge of the folded-up s-foils with a yellow one like the plate-element right next to it to complete the colour scheme in that area. Since half-minifig-scale doesn't allow for a minifig-sized door and entrance, I built it so that it can hold a cargo-container. The section in-between the cockpit and the dorsal gun turret. This section is quite a bit longer than the tiny cargo hold it represents in the Lego set, and I designed the interior to represent the corridor that leads to the individual crew quarters behind the cockpit area. I also extended the area behind the pilot seat (which is hidden under the cockpit canopy here) to represent the large cockpit with panel padding and some tech stations to either side, as seen in the show. 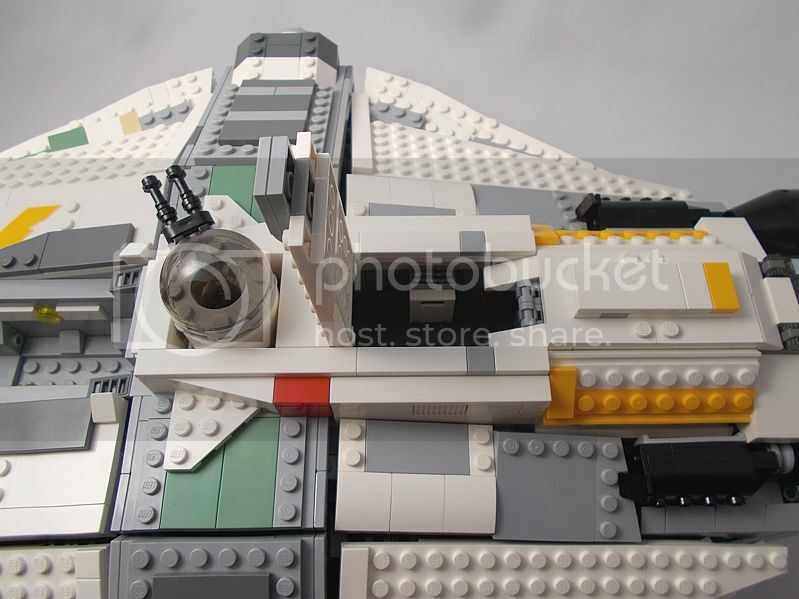 The larger build also allowed for some interior behind the dorsal gun turret. I built it as an open space with two lockers, one on each side. This could be a maintenance area. It's possible that I will re-design it later to represent some other area. 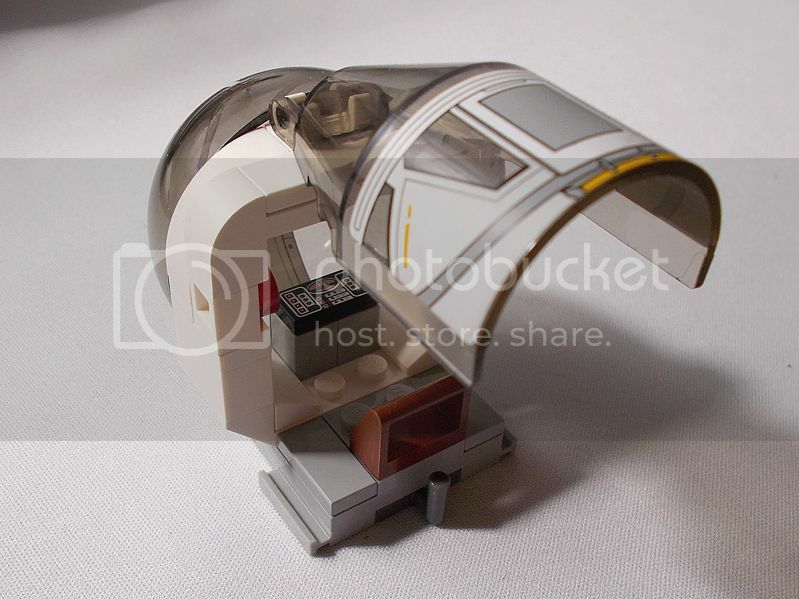 The front gunner bubble and the cockpit canopy are part of a small modular build that can be detached easily to get acces to the pilot seat and the front gunnery station and put a minifig in each. You've done great work with the shape. I also like the interior details, overall a great ship! 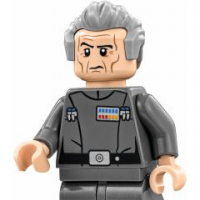 I love how we're getting a bunch of upscaled Ghost MOCs! Wow that's really great! 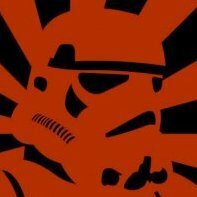 now I realise I actually do not like TLG's official ghost, yours is much better! It captures the look much better. I really love that subtle color scheme, quite different to the official set. It looks more "grown up" if you know what I mean. Good to see you also managed to put some interior in. Love it - much better, Great looking feet too. I do just feel that the cockpit piece needs to be bigger, but not sure what would be best piece. I would really love to see it big enough to sit two by two. This is amazing! The Ghost finally has a good lego incarnation! 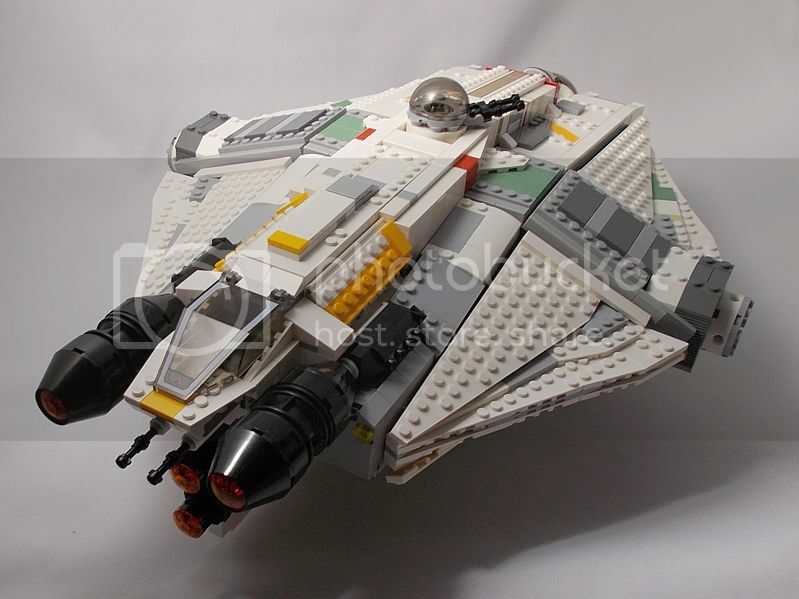 I really wish I could could build this instead of the dinky lego one I'd love to see the Phantom, seeing as I've been trying to mod/moc one myself, and I just want to see it Really, just a great job on this! If Lego sold this instead of the made it would sell better I am sure. Very good work! Looks much better than the TLG version. First: Thanks a lot to all of you! I'm glad you like it. Thanks rollermonkey. 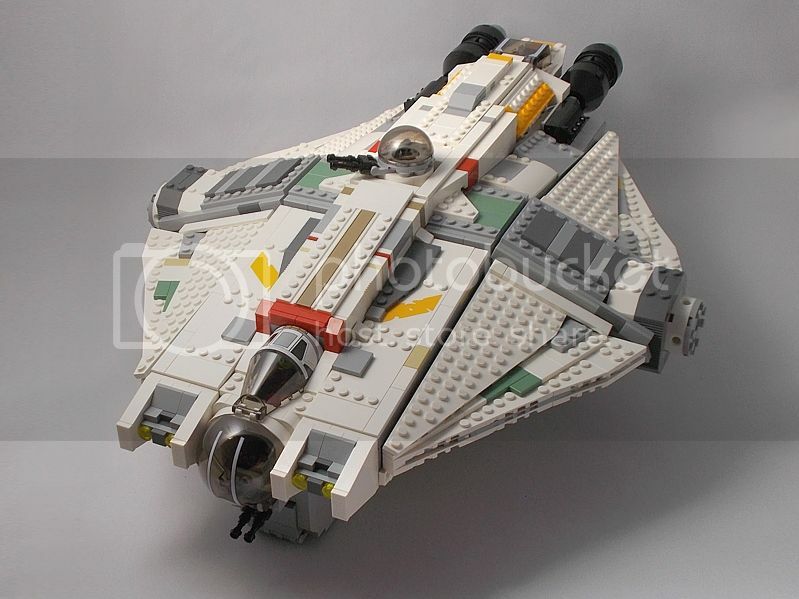 I've been looking hard to find some upscaled MOCs of the GHOST on the internet, but my search yielded no results. Retrospectively, this was a good thing, since it's usually the case that I try to re-create a good MOC of a vehicle I like if it's executed well. In the case of the GHOST, I had to figure out everything myself, but this makes it totally my own baby, which is great. 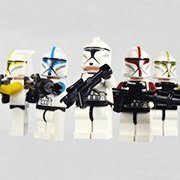 As for other upscaled MOCs, can you provide some links? I'm very interested in how other MOCers have solved some of the difficult areas, especially the triangular angled areas that define the ship's overall shape. ... It captures the look much better. I really love that subtle color scheme, quite different to the official set. It looks more "grown up" if you know what I mean. Good to see you also managed to put some interior in. Thanks TWP. You're absolutely right about the colour scheme. It's tempting to add tan, dark tan and dark grey bricks and plates here and there to represent weathering, but it can easily become too much. Less of that is more in Lego form. As for the popularity of the ship: I guess it can grow on people. The GHOST is kind of the seventh main character of the show. 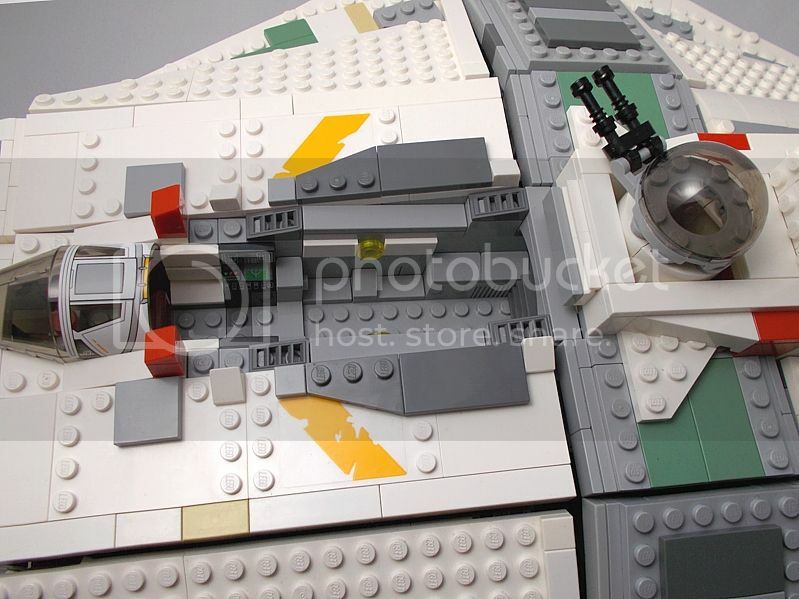 I like how it incorporates the angled geometric surfaces and the huge engines similar to the corellian Corvette and the flat-ish, wide shape of the main hull similar to the Falcon into one design. The B17 elements added on top of that give it its own character and martial look. It really is a great ship design. Thanks, BJM. A two-by-two cockpit would be great, no doubt, but in order to get this, you'd need to make this ship a lot bigger, or oversize the cockpit in comparisson to the rest of the model and thereby compromise the proportions. Maybe someone manages to do this in keeping with proportions and stability - I'd like to see that! Thanks, GuyDudeMan27. You want to see the PHANTOM detached? I'll make some pictures when I'm back from work and some friends tonight. I modded the PHANTOM a bit, but it's largely the build from the official Lego set. I eventually would like to make it a bit smaller. Thanks duboismerci. If my GHOST would be an official set, it would be quite expensive, I guess. I didn't count the number of bricks I used, but I estimate it's well over 2.000 bricks used, maybe nearing 3.000 or even more! Is there a way to estimate the number of bricks used by weighing the model? I figure with models that large the amount of bricks used in comparisson to the weight of the model will average out. 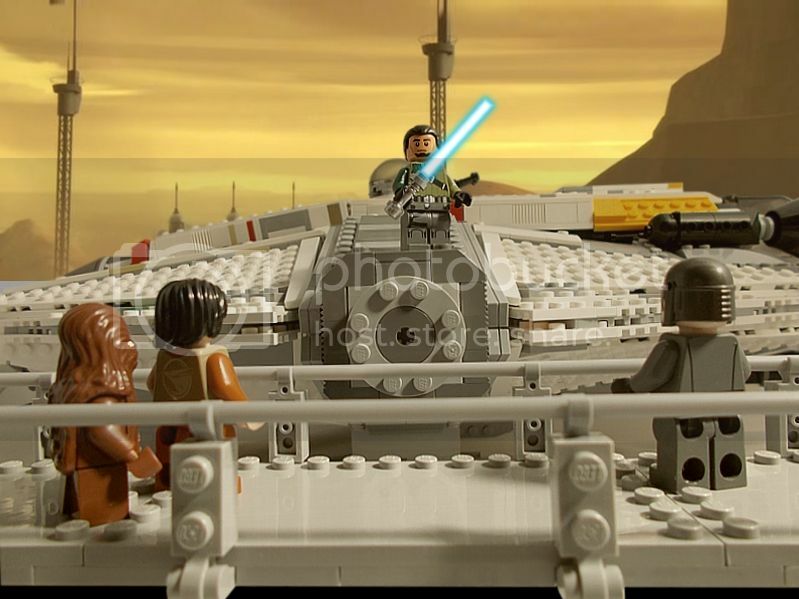 I think your MOC sums up my feelings on the Rebels TV series and the sets in general. After watching the first couple of episodes I've been enjoying it.. and I like that the Ghost is like a home to them... it certainly has a real feel of the OT but the set that was released just didn't work for me at all. 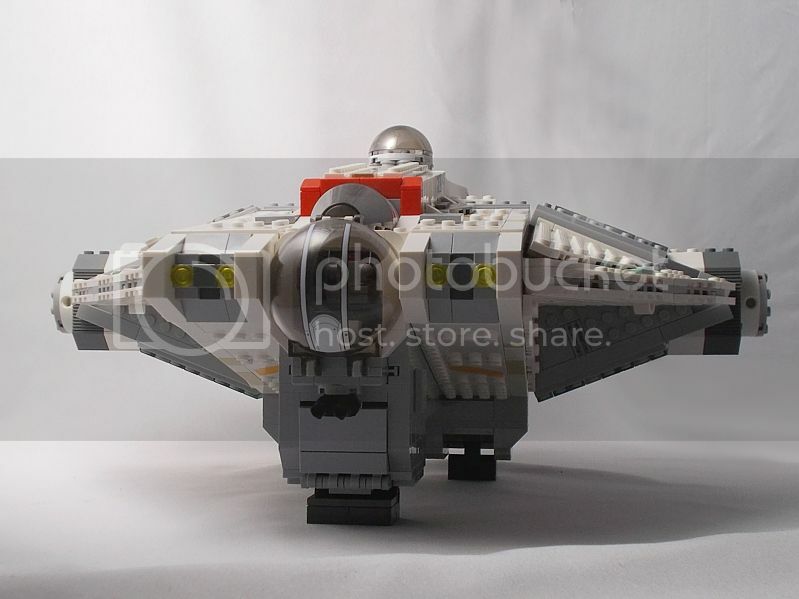 This MOC does. 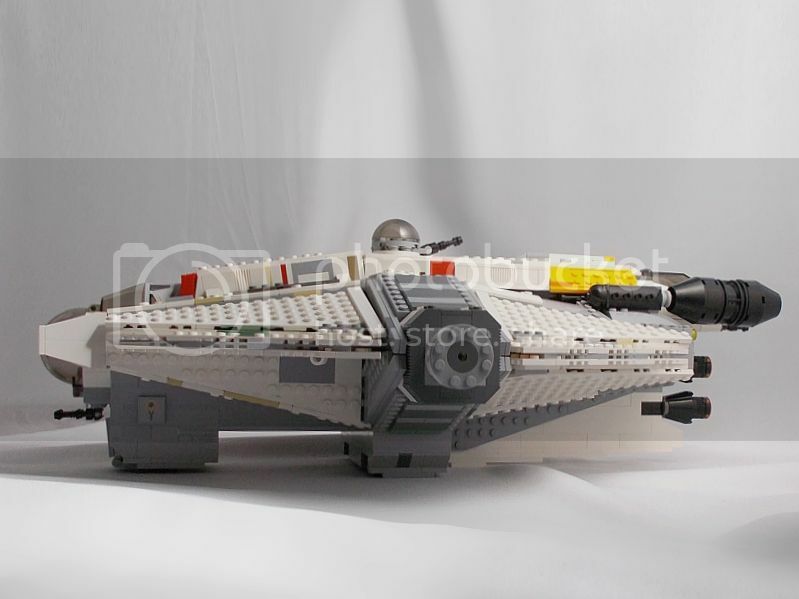 I know there's a clamour for large sets and TLG has been making smaller versions of some large sets such as the AT-AT and Star Destroyer (both of which I think are excellent) but the Ghost just doesn't work for me in the scale Lego released it. 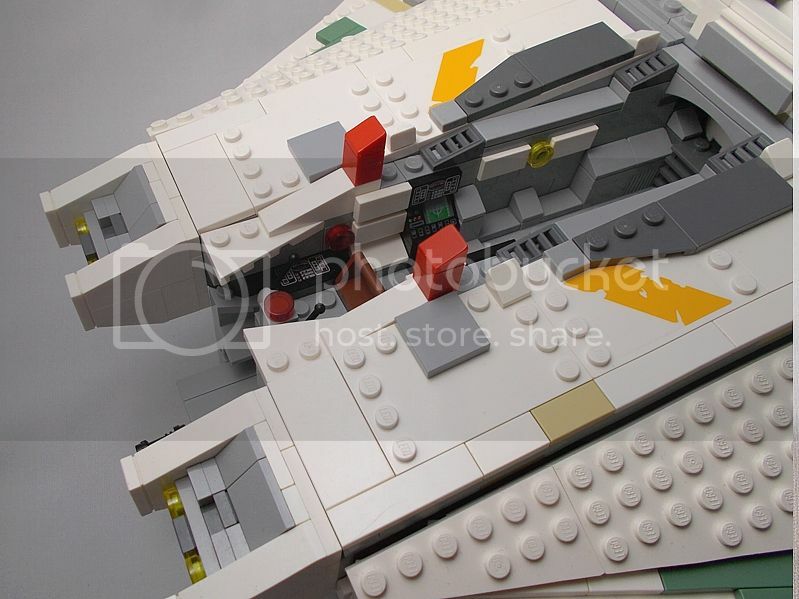 The Ghost needs to have that area below it and with the scale of the Lego version it looked too clunky... this shows that with a larger ship that area can have a play feature and still look in proportion meaning the ship doesn't look like a flying brick. Very well done! 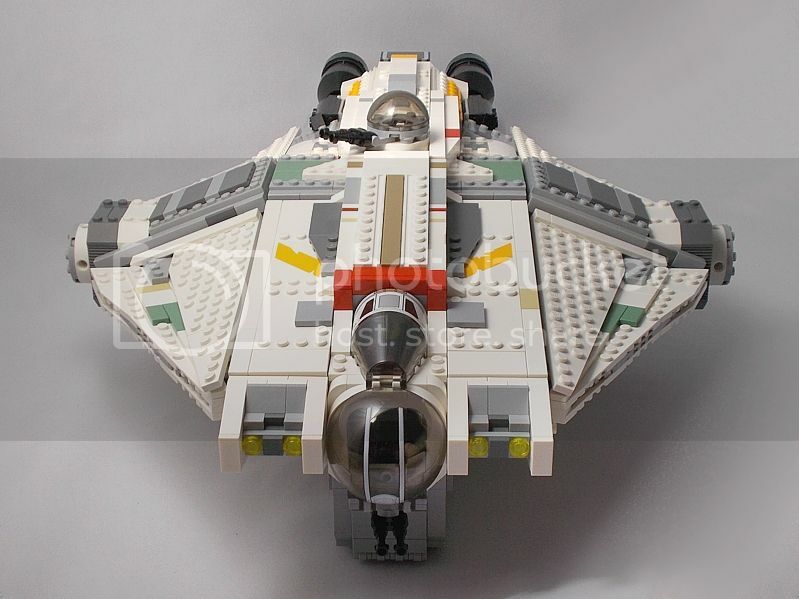 This is still on my list of things to MOC but like you, I've got to figure out what scale to do it in. oart of the problem is the lack of interior layout/plans that are available. From watching the show, it appears that one long hallway runs from cockpit to the Phantom. about halfway down the hallway, there's a door that leads to the turret ladder and the escape pods/docking rings. Between the cockpit and that door, there looks to be two rooms on either side of the hallway, that are the crews quarters. Those are the confusing part to me because if you look at the exterior, those fit into the central dorsal section - basically the part where you made your hallway. On the show, it doesn't look like those would fit into that section from the outside. From the cockpit, there's a ladder that leads to the nose gunner section. Behind the gunner section is a small gantry that has a ladder down to the cargo hold. This I think is doable but again, scale becomes an issue. You did a great job but what I think you did well was the exterior. It REALLY captures the overall look! I haven't seen the show yet, but this MOC looks fantastic! I love the scale you've chosen. You got the angles just right! This is really nice, Jackson. I kind of thought the TLG Ghost was a bit mediocre, and not very appealing. You sir have made me rethink my position on this ugly-duckling ship. Would probably need two or three sets, and several BL orders to work some magic like this. I don't think I'm up for it, but thanks for sharing your wonderful creation. I can finally understand the shape of this ship! LEGO's is kind of messy, while yours is very smooth and sleek. I really think you did this ship justice! I actually kind of like the ship now, and feel the need to make my own, but lack the time.. 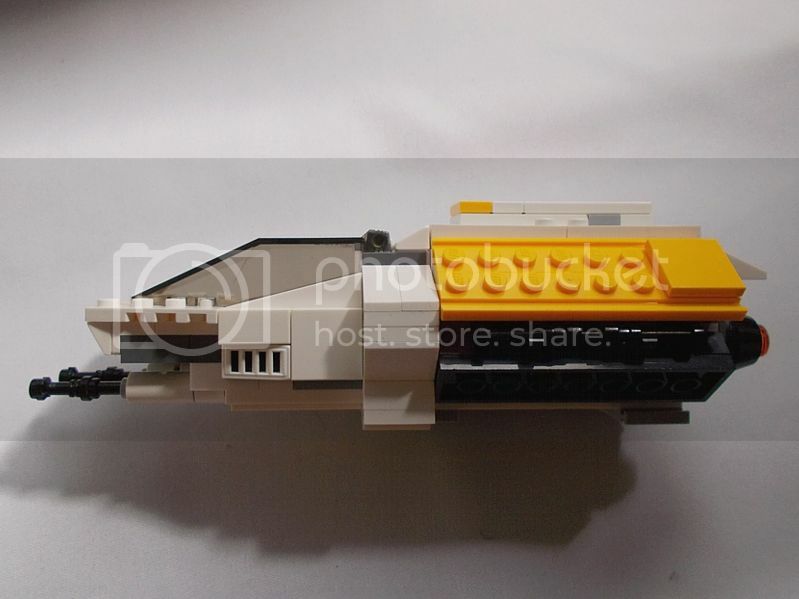 I just watched the first episode last weekend and thought if someone had created this ship with LEGO. Well, not only the ship but also a cool scene. Congrats! This ship has an interesting shape which TLG's version just doesn't capture properly at all, and the other big problem with TLG's is the size and position of the engines to accommodate the Phantom at that scale. Your version on the other hand does a really good job of capturing the essence of the ship and at the larger scale you have been able to put the engines in a much better place. Overall it could maybe be a bit wider and flatter, but you've done a great job. Thanks, TheBear. Actually, after having watched the 3rd episode and re-watching the first two episodes and pausing the scenes where you get a good look at the ship from different angles, I'd say it actually shouldn't be more flat. I also discovered that the main engines should be a little bit higher. So I revisited the whole upper back and improved it by moving the engines 1 stud higher, and using the Phantom's s-foils hinge parts to create the black horizontal stripe which runs from the main engines to the upper edge of the dorsal docking area. 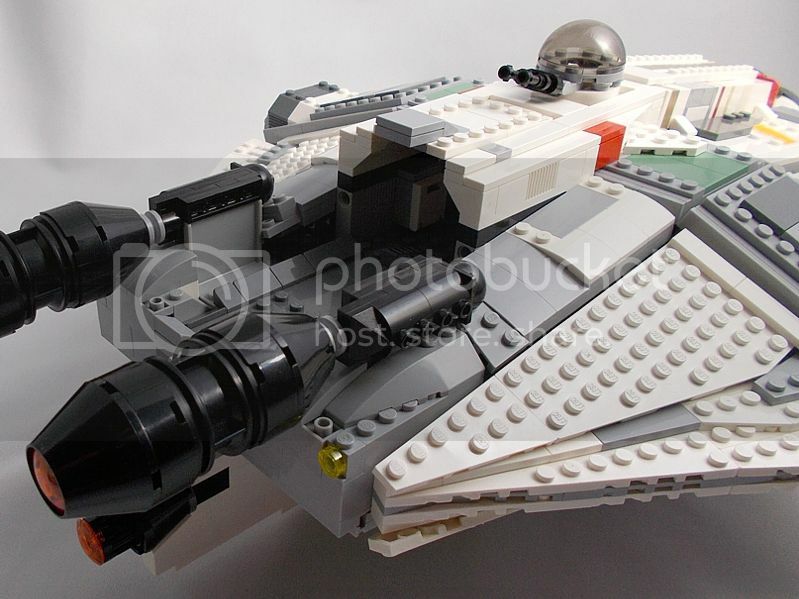 Wow, this is a beautiful MOC. It perfectly captures the sleek look of the Ghost and has a sizable interior to boot. The large and detailed underside is another welcome addition. Sweet... I wish I could build something so clean. Starting... some tasty screen captures.